Take Spyderco’s most iconic folder and introduce the highest alloy stainless steel, CPM S110V then incorporate the latest design improvements and what you have is the ultimate in high performance. The performance of the Spyderco Military was legendary already. Using CPM S110V steel takes it off the chart with unrivaled cutting ability and extreme edge retention. The Spyderco Military was introduced in the early 1990’s by Sal Glesser as a knife designed to be carried by military personnel. Since its introduction it has been extremely popular and quickly rose to flagship status. Over the years there have been a vast number of variations and sprint runs using various steels and handle materials. Steels have run the gamut from ATS-34 back in the 1990’s to CPM S30V in the early 2000’s and now the coveted CPM S110V. The current standard production models are available in either CPM S30V or CPM S110V which is the model we’re reviewing here. Handle materials range from G10 to Titanium to Carbon Fiber. The Military is a large knife with a big handle so you can get a lot of leverage on that sizable 4” blade maximizing the use of the wonderful geometry. Performance has always been the hallmark of the Military and Spyderco in general for that matter. A classic legendary design that carries very flat in pocket in a light weight package. The impressive 4.0” flat ground blade, with lots of belly and the formidable CPM S110V steel leads undeniably to extreme cutting performance. The beauty is in the performance and the Military’s blade is made to do one thing and one thing only and that is cut. With the distal taper, large belly and thin geometry it slices extremely well. At .145” spine thickness and .020” behind the edge thickness it does perform very well. The tip is however very fine so you have to be careful and resist temptation to use the tip for prying. Instead it excels at very fine work. Crucible’s CPM S110V is the highest alloy stainless steel made today. It’s extremely stainless, has very high wear resistance and impressive strength and toughness. It’s a very aggressive cutter especially with a coarse edge and will feel like cutting with a hacksaw. It does however take a very nice edge and will get extremely sharp if you have the patience on the sharpening stone. It’s really not that difficult to maintain the edge with simple tools like the Spyderco Sharpmaker or Silicon Carbide bench stones. With such high edge retention you won’t have to sharpen it as often as other steels, just light touch ups every once in awhile usually depending on actual use. Spyderco is upping the stakes on CPM 110V lately and is currently using the steel in the following USA-made models – Military, ParaMilitary 2, Manix 2, Manix 2 LW, Native 5 and Native 5 LW. At 5.52” long the G10 handle is large, but super comfortable in use. For sure, the Military feels light in hand due to the great balance. The Dark Blue G10 is pleasing on the eyes and has a good amount of texture without being too aggressive on the hand. But is it blue or is it purple? Hmm, we’ll let you decide. With the new larger hardware and larger standoffs its open back and doesn’t have the back spacer that the older models had. It features a new Paramilitary 2 type pivot and stepped blade stop it’s very solid, again upgrades from prior models. The pocket clip has also been updated so it won’t tear up pockets as much. The handle provides good solid grip in all of the different grip types and allows you to move all the way back on the handle for chopping if needed. It’s not all that thick so it does carry smaller and thinner in pocket than the size of the knife would appear it would. In use the handle provides a lot of leverage on the blade so making hard cuts seems easy and easy cuts seem like nothing. The solid feel gives you a lot of confidence either bare handed or with gloves on and the lock is easy to release even with thick gloves on and that is a huge plus for a hard use work knife. The Military is tip down carry right hand only. Tip down carry is very quick and easy to deploy and some like it better than tip up. It seems quicker to get the thumb on the hole and flip out the blade with tip down. For me I tend to prefer tip down for that reason, but that is a personal preference. Lockup is solid with the Walker Liner Lock and in my own experience they don’t tend to move much over time either. Liner Locks provide easy one hand operation for both opening and closing, not having to use two hands can be a large benefit when working and/or wearing gloves. The pocket clip works very well and Spyderco choose to make it black on this model. Not quite deep carry, but it does ride low in pocket so it doesn’t show too much while providing quick and easy access even with gloves on. Fit and finish is excellent and I didn’t notice any issues at all with quality. The finish on the S110V blade is a very nice smooth satin, jimping is good and clean. Blade centering was dead center on mine and quite simply the sharpest production knife I have ever tested out of the box. The edge angle was about 18 degrees per side with clean grind lines. Quality overall was excellent as was expected in this grade of knife. Now we get down to it, how does it perform? I thoroughly tested the S110V Military using 5/8” manila rope, cardboard, wood, 175# heavy duty zip ties and power cord. First, I reprofiled the edge to 15 Degrees per side using an Edge Pro Apex and 320 grit Mold Master Silicon Carbide stone and finished with a Silicon Carbide Mold Master 400 grit (40 Micron) stone. The edge was extremely sharp and would whittle hair before testing. It was very aggressive and had a lot of bite. I started with the 5/8” manila rope first. It’s very hard on edges and not easy to cut, the edge has to be both sharp and aggressive to cut rope cleanly. My process is to use draw cuts, I put wood on my scale and cut the rope on the wood and keep track of down force. I cut until I reach 20 LBS of down force, with one cut being equal to a single draw cut that passes all the way through the rope. I check the starting down force and then check every 20 cuts until 20 lbs of force is reached and the process is over. The S110V Military started off at 9 lbs of down force. It cut aggressively and clean making a loud crunching sound. I continued on cutting and checking every 20 cuts for down force and edge damage along the way. In the end it cut 1,080 cuts on 5/8” manila rope with no edge damage and would still slice phone book paper. The edge did smooth out some, but it was still cutting aggressive all the way to the end. This highlights the outstanding performance of CPM S110V. Next up was Cardboard. I use cardboard because a lot of typical EDC use is opening boxes or cutting up cardboard. It can be very abrasive and kill the edge very quickly on less wear resistant steels. Cardboard can be very unpredictable and have a lot of clay and other junk it. 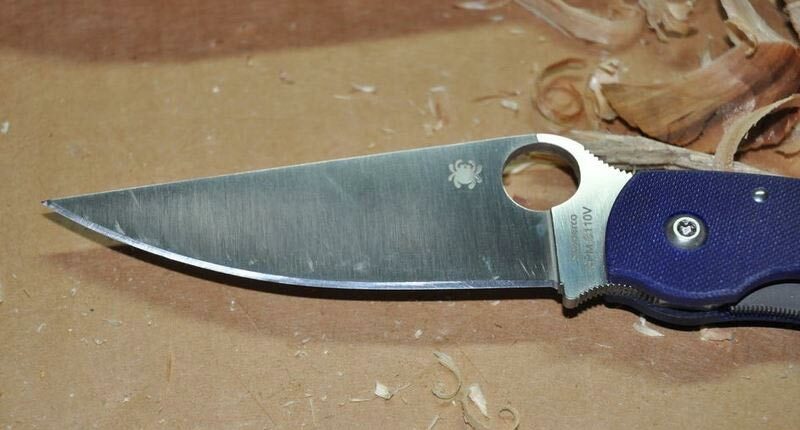 The knife was resharpened before this stage. My process was to cut 100 linear feet of cardboard and check for both sharpness and edge damage. This keeps going until the edge loses phone book slicing sharpness or I feel the amount of cardboard that would be cut becomes insane. 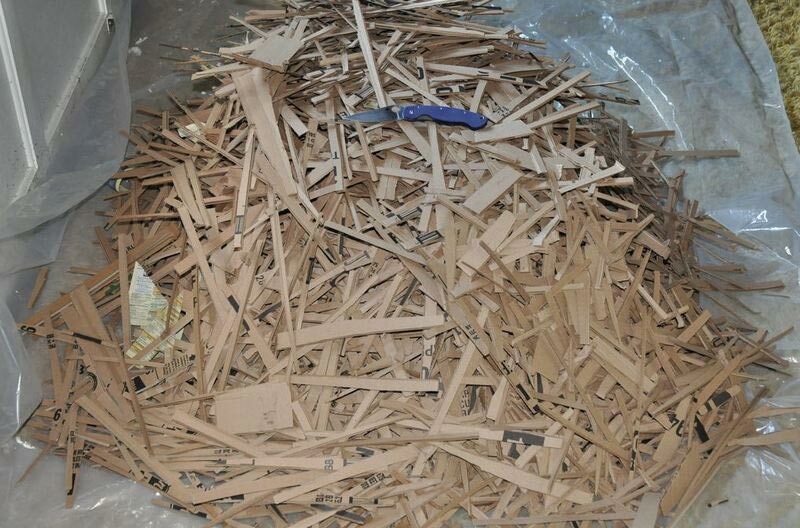 I ended up cutting 6,000 linear ft of cardboard, that’s 1.82 km, 1.14 miles or 1,829 meters! The knife would still slice phone book paper after this amount of cardboard. I stopped there because it would have kept cutting for a very long time. I noticed zero edge damage and the edge was still very aggressive and sharp. Slicing through the cardboard was easy due to the excellent blade geometry of the Military. Very easy to control cutting the thin strips in an extended cutting test that took 2 days to complete. Bravo Spyderco. 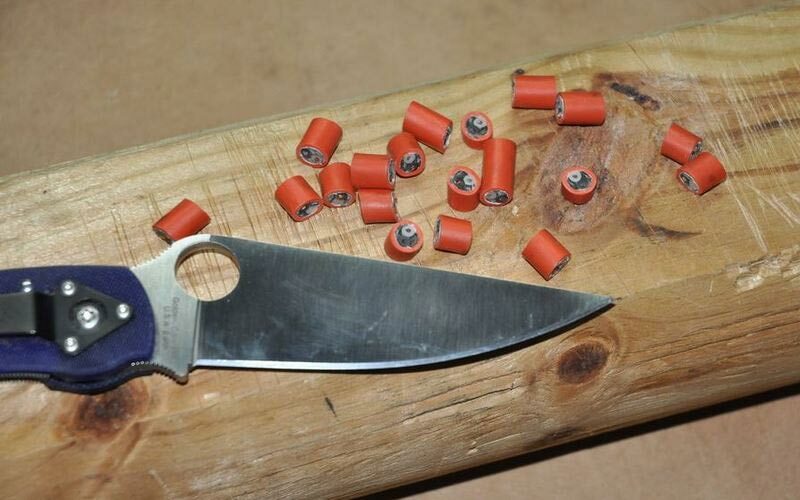 The knife was not resharpened for the rest of the testing. On to the wood cutting next. I use wood to test edge stability because I cut deep and shallow along with snapping the edge out sideways on a 45 degree angle. No damage was noticed nor was any loss in sharpness. 175# heavy-duty Zip Ties next. I use these to stress the edge and they are very hard on edges, I push cut through the Zip Ties 20 times and check for damage and loss of sharpness. I noticed no damage or loss in sharpness after the zip tie cutting. Zip Ties are actually very hard to cut through. I have to put my off hand on top of the blade and push the edge through resulting in the edge sticking in the wood after each cut. The edge was still phone book slicing sharp. Up last was power cord. I use this to again test for edge strength and stability cutting though copper wire. I push cut through the power cord 25 times and check for damage and or loss in sharpness. Cutting the power cord wasn’t too hard at all, cutting very clean and in the end guess what? – zero edge damage and the edge was still phone book paper slicing sharp. Overall the CPM S110V performed outstanding with no noticeable edge damage, chipping or rolling at 15 degrees per side and 400 grit. So what else it out there that may compete for your hard earned dollars in considering the Military CPM S110V? Well, the first obvious choice is the standard Spyderco CPM S30V Military which is cheaper at about $150. While CPM S30V won’t have the extreme edge retention that CPM S110V does it will be somewhat easier to sharpen for most than CPM S110V. Also offers different handle colors. The Spyderco S110V ParaMilitary 2 is also cheaper, at about $150. It’s smaller, easier to carry, has a 4 way clip and is lighter. Performance will be roughly the same as the S110V Military, but without the size. It also has the Compression lock for those who don’t like Liner Locks. 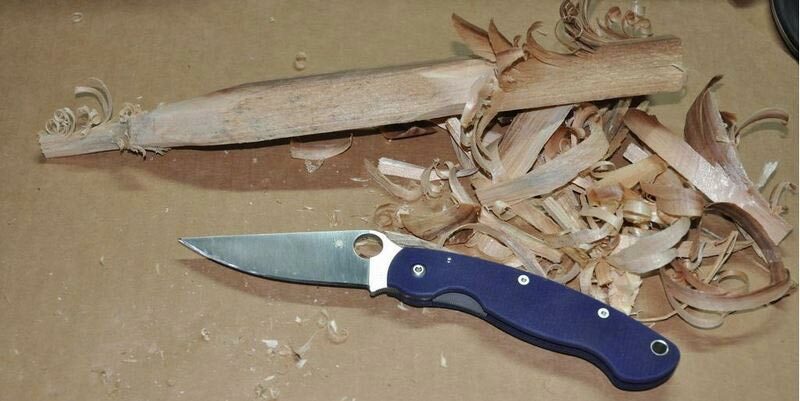 The PM2 is an extremely popular option, so much so that the PM2 can be hard to find sometimes. The Spyderco S110V Manix 2 G10 is about $140, a heavier duty type knife with a 4 way pocket clip and Ball Bearing Lock. Another very popular model that will give the same performance in a smaller package. The Spyderco S110V Manix 2 LW FRN is about $110, a light weight version of the Manix 2, weighs only 2.9 ounces. It is considered the best deal for those who want to join the CPM S110V party at the lowest price of admission. Finally, consider the Benchmade 940-1 in Carbon Fiber and CPM S90V. It’s more expensive at about $260 but it’s extremely light weight at 2.9 ounces. Like many Benchmade favorties it comes with the excellent Axis Lock and left or right hand tip up carry. Note the blade is thinner than the CPM S110V Military and shorter at 3.4”. Do you need CPM S110V? Before jumping on the super-steel bandwagon, you may want to think carefully about you’re signing up for with CPM S110V. In short, it will be more difficult to sharpen than the more common steels we have all become used to sharpening. That said, it’s not impossible to deal with using the right equipment like a Sharpmaker, Silicon Carbide or even Diamonds. Ceramics also work very well with CPM S110V for touch ups. 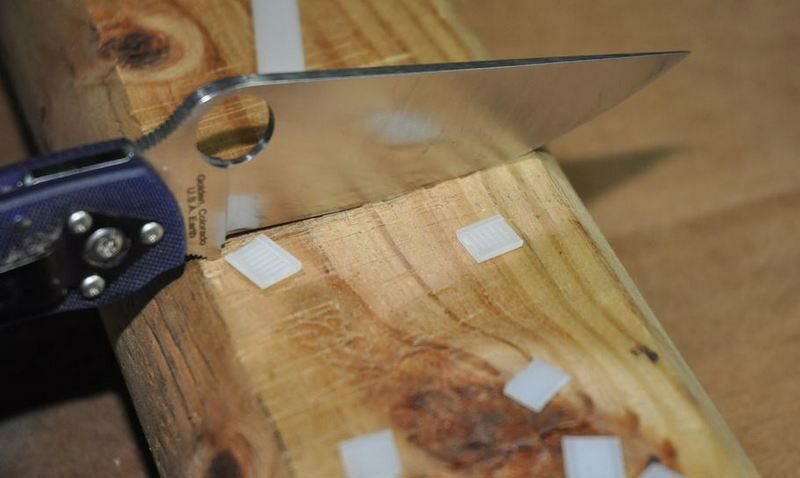 Just know that the extreme wear resistance comes at a price – and that price is your time on the sharpening stone when the time eventually comes (and it will one day). So is the Spyderco Military in CPM S110V the ultimate knife? In the end it depends on what you want or need as a customer. Do you need a large knife? Do you need extreme edge retention? Do you like tip down carry, right hand only? The CPM S110V Military is a flat out ultimate high performance knife that will take on just about anything that most people would use a 4” folder for in regular EDC use. Moreover, it will perform well at hard use tasks that other knives are simply not up to. So, if you’re looking for such a high performance knife you need to look no further. Right hand carry tip down only (for some), CPM S110V may be hard to sharpen for some. Mixing an already legendary design with the ultimate in blade steel was only going to have one result - awesomeness. For those who need or want a knife that will just keep cutting. Review by Jim Ankerson. Jim is a lifelong knife enthusiast, designer, steel consultant and meticulous tester of fixed blade and folding knives.